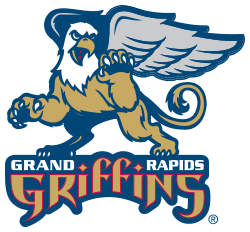 The Grand Rapids Griffins fell to the Peoria Rivermen on Friday night by a score of 3-0. This is the second time in just over a week that the Rivermen have beaten the Griffins in Grand Rapids and this is the first time all season the Griffins have been held without a goal. The game remained scoreless until the third period when Peoria netted three goals, two even strength and one with an empty net. The inevitable game-winner was scored by the leg of Peoria’s Adam Cracknell after a deflection in front of the net. Neither team could score on the power play, though; both went 0-5 with the man advantage. Despite being shutout, Grand Rapids did out-shoot Peoria 33-32 for the game. Peoria goalie Jake Allen was stellar in net as he recorded his first shutout of the season on 33 shots. Griffins’ goalie Petr Mrazek only allowed two goals on 31 shots faced. Mrazek wasn’t beaten until 10:59 into the third period. The loss on Friday night drops the Griffins into a tie with the Rockford IceHogs in the Midwest division. Rockford dropped a tough game in overtime Friday night to the Milwaukee Admirals, but still earned a point to move back into a first place tie with both teams sitting at 28 points. Grand Rapids had just taken over first place on Sunday afternoon by beating Rockford 4-2. After only having two games scheduled this week the Griffins have a busy week of games in the upcoming week. Sunday, Grand Rapids will travel to Toronto to face off against the Toronto Marlies. Then, on Wednesday, the Griffins return home to battle the Rochester Americans at Van Andel Arena. After Wednesday’s game with Rochester, the Griffins will stay at home for games on Friday and Saturday night against the Abbotsford Heat and the Chicago Wolves.